Dog owners who are interested in trying out acupuncture for their canine companions, may be wondering whether dog acupuncture has side effects. This is a very reasonable concern, considering that any form of healing, from traditional medications, to supplements and natural treatments always seem to have some sort of side effects going on. Acupuncture is no different. While the side effects of acupuncture are rare, they do exist and it’s important to be aware of them. Following is a list of dog acupuncture side effects and complications. One of the most important precautions that dog owners should take before having their dogs undergo acupuncture, is ensuring that their dogs are properly diagnosed. For instance, if the dog should happen to have an undetected life-threatening condition such as cancer, the use of acupuncture may mask the clinical signs resulting in a delayed diagnosis and treatment. This can mean that, in a serious condition as cancer, precious time may be wasted, and it may be just too late to save the patient. Another factor to consider is that the pain reducing “side-effect” of acupuncture may encourage dogs to become overly active which can cause them to injure themselves and overall hinder the healing process. If your dog seems in pain after an acupuncture session, you may not be imagining things. One surprising “side effect”of acupuncture is the intensifying of the original pain. The medical term for this is”sequelae,” which means it’s a consequence that exacerbates the problem being treated. Fortunately though, the increase in pain is for the most part short-lived, generally lasting anywhere between 24 and 48 hours. What’s likely happening in this case is that the dog has undergone “over-puncturing.” This often means that either too many points were used or perhaps the wrong ones were selected or perhaps the needles were left for too long or at the wrong depth or too much stimulation was applied. The issue should be brought to the acupuncturist’s attention so that it can be corrected in the next session. The risks for these side effect are lower when the acupuncture session is conducted by a knowledgeable practitioner who is experienced in this field. There are scenarios where acupuncture may not be advisable. 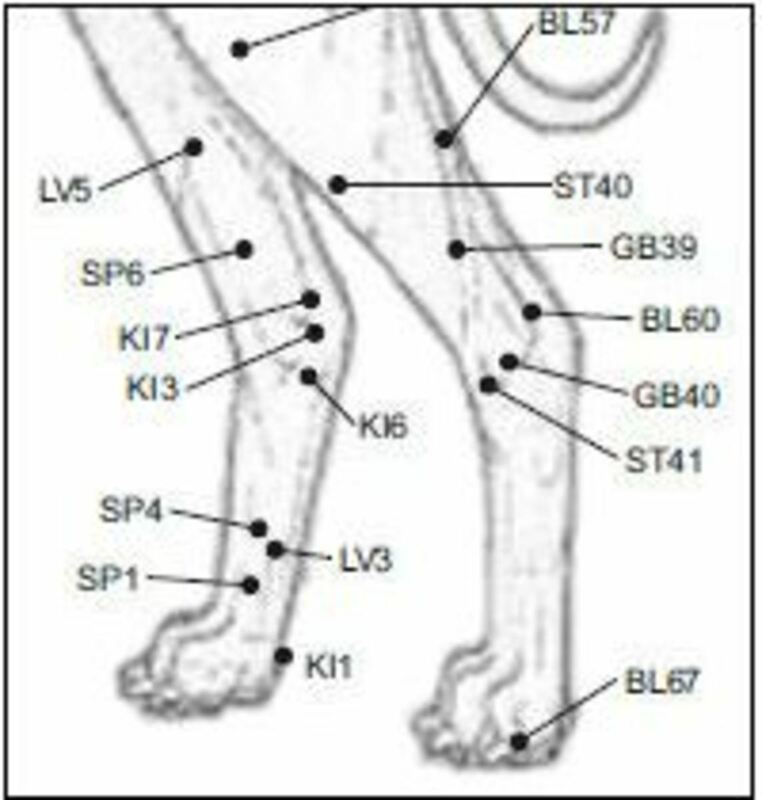 For instance, in pregnant dogs, acupuncture may be contraindicated, especially if the acupuncture points below the umbilicus are likely to be used. It is also best not to do acupuncture on dogs who have recently eaten a heavy meal or have been bathed or are soon to be bathed after the acupuncture treatment. Acupuncture should also be possibly avoided in dogs who are prone to being overly frightened, enraged or dogs who are fatigued. If the dog cannot be comfortably restrained and kept still for the acupuncture treatment, acupuncture is not recommended. And what about dogs suffering from certain medical conditions? Acupuncture is not advisable among dogs with certain health disorders such as dogs suffering from blood clotting problems or other blood disorders. Needles should also not be used in areas where there are local malignancies or skin infections. Also, dogs who have been treated with steroid shots or atropine or narcotic shots, should not undergo acupuncture, but there may be exceptions to the rule. It’s therefore best to consult with a professional for advice before having acupuncture performed on the dog. Some side effects and complications of acupuncture therapy in dogs may occur as a result of negligence. It may be challenging at times determining whether the complications are due to negligence or whether they are adverse side effects. Generally, burns associated with electroacupuncture, bleeding, infections and even injury to nerves and vital organs are complications that are unlikely to occur in the hands of an experienced professional. Other complications may include excess bruising, broken needles and migrating needles. It’s very important that the acupuncture practitioner is well aware of the anatomy of the areas that are being punctured. This is fundamental as this knowledge prevents injury to underlying structures. To play it safe, it’s always best to enlist the help of a professional who is certified to practice acupuncture. Only a licensed veterinarian should be ultimately performing acupuncture on dogs. Organizations that have made of acupuncture their area of specialty, include the American Academy of Veterinary Acupuncture (AAVA), the American Board of Animal Acupuncture (ABAA), The Association of British Veterinary Acupuncturists and The International Veterinary Acupuncture Society (IVAS). International Veterinary Acupuncture Society, What is Veterinary Acupuncture?